These packages are available at our location. Padre Canyon Foods is the exclusive caterer for Padre Canyon Resorts and Sentierre in Ivins. 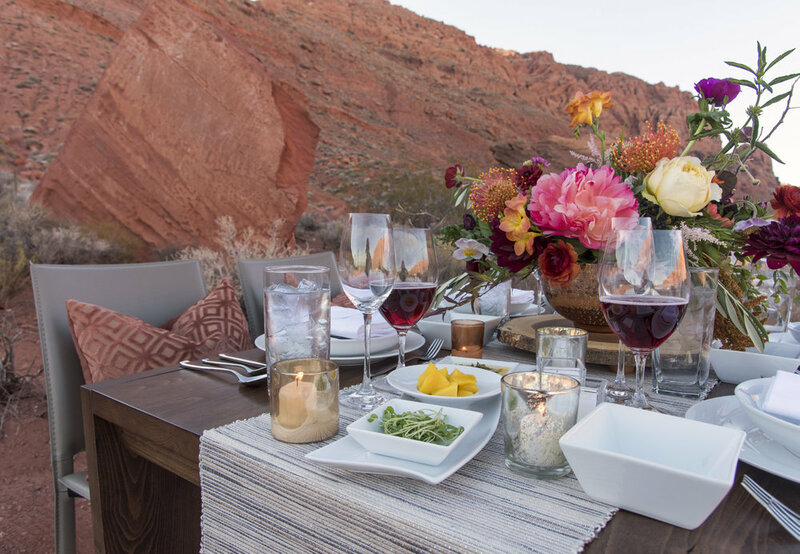 If you are going to a show at Tuacahn, what better way to start your evening than with a special private dinner just steps away from the theater. Our special Padre Canyon Tableau location dinner starts 90 minutes before the show and typically lasts just under an hour. We allow 30 minutes before the show to transfer your group to the VIP entrance area or Box Office to enjoy the pre-show entertainment or do a little browsing in the Gift Gallery before the start. Service is typically per person with a minimum of 20 guests. Your dinner includes a seasonal menu designed by you and chef made up of 3 courses of a soup or salad, main entrée with sides and a scrumptious dessert course. Sodas and coffee are included. Beverage pouring, or corkage service can be added. Enjoy the evening breeze, watch the magnificent sunset across the rocky sentinels of Padre Canyon and invite your friends to our firelit terrace. We host your group for small bites and beverages providing 8 different seasonal hors d’oeuvres with homemade beverage infusions and sodas. Beverage pouring, or corkage service can be added. Service is typically per person for 2 hours with a minimum of 20 guests and a maximum of 40 guests. Service time can be extended to suit your event. If you are going to a Tuacahn show, VIP drop off access to the show is also available. Going on an adventure in Snow Canyon State Park? Snow Canyon Café is your base camp. Drop your vehicles, grab some snacks and lunch provisions and head out. We’ll be waiting for you with chilled juices, restrooms and cool down service upon your return. Service is typically per person for a total of 90 minutes (30 pre, 60 post) If you need pickup in the park, transfer can be added anytime during your event. For an additional fee, full use of master bath facilities can be included with indoor/outdoor shower, steam shower, bathtub, hairdryer and all bathing amenities.